DARREN WEIR trains this extremely well bred colt ...very excited to have this colt with the "ALL-CONQUERING" Darren Weir stable...taking racing by storm!! HIGH CHAPARRAL (IRE) (Bay 1999-Stud 2004). 10 wins-2 at 2, The Derby, Gr.1. Champion Aust. Sire (AEI) twice. Sire of 1448 rnrs, 880 wnrs, 90 SW, inc. So You Think (MVRC WS Cox P., Gr.1), Dundeel, Shoot Out, Monaco Consul, Contributer, Toronado, Wigmore Hall, Lucky Lion, Free Eagle, Descarado, Redwood, Fenway, High Jinx, Pondarosa Miss, Wrote, Joanna, Enaad, Western Hymn, Frine, Elektrum, Omei Sword, Alpine Eagle, Forever Loved, Show the World, etc. APPLAUDING, by Pentire. Unplaced. This is her first foal. Alibi (Darci Brahma). 4 wins at 1200m, 1400m, S$233,976, in 2016, Singapore TC Graduation S., Graduation P., Any Humour S., 2d Singapore TC Saas Fee S., Sgp-3, Benchmark 89 H., Balmoral Castle S.
Yellen. 4 wins from 1400m to 1700m, A$161,770, to 2015-16, VRC Red Rock Deli H., MVRC Mocosa the Graduate H., 2d MRC Chris Boothroyd H., 3d VRC Metricon Trophy H., MRC Allan Wicks H., Ladbrokes Park H., Ballarat TC Lakeview Hotel H.
Pentire Babe. Winner at 2200m in 2015-16, 3d ARC Adesso H.
Zamerit. 2 wins at 1600m in Aust. Z' Honor. 2 wins at 1400m, 1600m in NZ. Pushtheboundaries. Winner at 1600m in 2016-17 in NZ. Secrets Abound. Winner at 1600m in NZ. Tahsin. 2 wins at 1600m in 2016-17, 2d ATC Schweppes H.
HONOR BOUND (Honor Grades). 6 wins. See above. GREENBACK (McGinty). Joint third top colt on The 1987-88 NZ 2YO Free H. 9 wins-3 at 2-from 900m to 2250m, NZ$94,970, A$153,860, WRC Evergreen Lodge S., Gr.2, Qld Tatt's RC Tattersall's Cup, Gr.3, Murrumbidgee TC Wagga Gold Cup, L, ARC Pepsi Cola H., Avondale JC Peninsula Juvenile H., 2d STC Ansett Australia Welter H., Matamata RC DB Draught H., 3d WRC Thorndon Mile, Gr.1, Wellington S., Gr.3, Matamata RC DB Draught H., 4th WRC Thompson H., Gr.3. Glenrock David. 9 wins from 1200m to 1600m, A$121,635, AJC Spring Country Cup, Burwood H., 2d AJC PJ Bell Country Championship Final H., 3d AJC Holdings Redlich Gloweave H.
BEAU BRUMMELL (My Halo). 7 wins at 1100m, 1200m, S$480,212, Singapore TC Merlion Trophy, Sgp-3, Class 1 H., Graduation S., Class 3 H.-twice, Class 4 H., 2d Singapore TC Kranji C S., Benchmark 97 H., Class 4 H., 3d Singapore TC Three Rings Trophy, Sgp-3, Class 2 H., Sydney Turf Club Trophy, Kranji C S., Class 4 H., 4th Singapore TC Juvenile Championship, Sgp-3. AMRICA (Amalgam). 6 wins. See above. IMPERIAL DIAMOND - AMERICAN SOLDIER II (Mal.) (Imperial Seal). 11 wins-1 at 2-to 1400m in NZ and Malaysia, Perak TC Sultan's Gold Vase, L, Waikato RC Bardall H., 2d Selangor TC Yang Di-Pertuan Agong Gold Cup, L, 3d Singapore TC Lion City Cup, L.
Prince Lochinvar (Aythorpe). 5 wins from 1400m to 2000m, NSW Tatt's RC AJ Chown Welter H., STC Tooheys Draught Welter H., 3d STC Tulloch S., Gr.2. Amy Annie (Imperial Seal). 2 wins at 1400m, 2000m, 3d North Canterbury RC Inglewood S., L. Producer. MADISON GRAY (Mellifont). 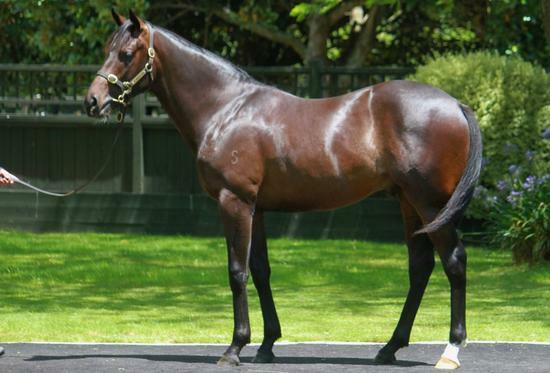 6 wins from 1400m to 2000m, NZ$95,913, Manawatu Breeders' S., L, 2d Wairarapa Thoroughbred Breeders' S., L. Producer.